The twin GRACE satellites were launched on March 17, 2002. 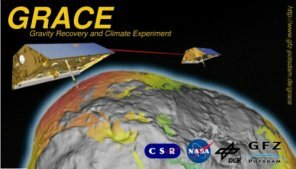 Since that time, the GRACE Science Data System (SDS) has produced and distributed estimates of the Earth gravity field on an ongoing basis. These estimates, in conjunction with other data and models, have provided observations of terrestrial water storage changes, ice-mass variations, ocean bottom pressure changes and sea-level variations. This portal, together with PODAAC, is responsible for the distribution of the data and documentation for the GRACE project. A brief overview of the science data flow is given at http://www.csr.utexas.edu/grace/asdp.html and more details are provided in the project documents. A complete list of relevant project documents has been made available (click here). Users are strongly urged to read these documents before proceeding with data analysis. GRACE is a joint partnership between the National Aeronautics and Space Administration (NASA) in the United States and Deutsches Zentrum Fuer Luft und Raumfahrt (DLR) in Germany. Prof. Byron Tapley of The University of Texas Center for Space Research (UTCSR) is the Principal Investigator (PI), and Dr.-Ing. Frank Flechtner of the GeoForschungsZentrum (GFZ) Potsdam is the Co-Principal Investigator (Co-PI). March 10, 2015: GFZ has generated and delivered AOD1B RL05 products for 1979-2000 based on ERA-interim data. November 17, 2014: JPL has generated and delivered RL05.1 Level-2 products for the period April 2002 till August 2014. The main differences between RL05.1 and RL05 are the changes to the IERS2010 reference system and use of the 100x100 S1&S2 air tides from Ray/Ponte (2003). RL05.1 also includes the reprocessed AOD RL05 from June 2013 till July 2014 (see below). Further information is provided in the JPL Level-2 Release Notes and the JPL Level-2 Processing Standards Document. September 26, 2014: The AOD1B RL05 products since 25 June 2013 have been reprocessed and replaced in the GRACE archives ISDC and PO.DAAC. On that day the vertical resolution of the ECMWF deterministic forecast model increased from 91 to 137 levels. Wind stress calculation for OMCT atmospheric forcing requires both temperature and humidity from the lowest model level, which is now 137. Specific humidity has been updated correctly, but temperature remained at 91, leading to a cold bias in the boundary layer and therefore a positive bias in the wind stress. Initial investigations have shown that the effect on gravity field modeling is severe and therefore also all Level-2 products since June 2013 have to be reprocessed (already done for CSR and GFZ). More details will be given in the GSTM2014 SDS Status Session (September 29) and is published on the web-site www.gfz-potsdam.de/aod1b. May 20, 2014: The AOD1B Product Description Document (see Documents Section following the link on the left) has been updated to Version 4.2. This version includes editorial changes to chapters 3.6 and 3.7 to better describe the correct usage of various GAx Level-2 products. April 7, 2014: GFZ has generated and delivered GAE and GAF Level-2 products in terms of Technical Notes TN08 and TN09. The coefficients may be used to correct discontinuities in atmospheric pressure data on January 29, 2006 and January 26, 2010, respectively. Details are described in chapter 3.7 of the AOD1B Product Description Document Version 4.1 which is, as the Technical Notes, available in the ISDC Documents Section (follow the link on the left). December 17, 2013: GFZ has generated and delivered a reprocessed RL05 time series called RL05a for January 2003 till July 2013. All RL05a Level-2 products are available at ISDC and PO.DAAC. When making your request at the ISDC retrieval pages, the RL05a GSM products can be found under the same revision number (â€œ5â€�) as the RL05 GSM products and are distinguishable by the string â€œ_005aâ€� (instead of â€œ_0005â€�) at the end of the product name. At the PO.DAAC archive, the RL05a GSM products can be found in the directory â€œallData/grace/L2/GFZ/RL05â€�. Note that GAx products are not affected and need not to be replaced! Further details are described in the â€œRelease notes for GFZ RL05 GRACE L2 productsâ€�, also available at both archives. For the missing months in 2002 (soon to be delivered) and all upcoming months starting with October 2013, only RL05a products will be generated, i.e. the GFZ RL05 time-series will not be continued. March 17, 2012: At 10:46:50.875 UTC, the orbiting phase of the twin GRACE satellites has completed 10 years in orbit. In recognition of this anniversary, the project will release over the next few weeks a new gravity solution based on a complete and detailed reanalysis of the GRACE mission data set. The solution, designated the GRACE RL05 Solution, is the result of reprocessing the 10 year data set, taking advantage of improvements in modeling and data quality and adding additional data from the extended mission. The improved accuracy and extended data length on which the solution is based will allow more complete studies of seasonal and decadal signals involved in climate change processes. In addition to the improvements associated with an additional iteration of the mission data, the RL05 solution benefits from a significantly improved AOD1B background model for the correction of high frequency atmosphere and ocean mass variations, improved ocean tide models and improvements in the Level 1B data. To accommodate investigations that will be presented at the EGU in April, an initial release, covering a six year span (2005 till 2010) from the GRACE GFZ RL05 Level 2 Solution, has been placed in the archive by the anniversary epoch including the AOD1B RL05 Model, covering the period from July 2002 through December 2011. The Level 1b version 2 data and remaining Level 2 gravity solutions, along with updated documentation, will be placed in the archives during the following weeks. Further details on the RL05 release will be found in the monthly news letter as they develop. Release 04 Level-2 products and documentation are still available. For details see below. The GRACE Science System Monthly Report May 2016 is available now. The next GRACE Science Team Meeting together with the DFG SPP1257 Final Colloquium will be held on September 17-19 (Mon-Wed), 2012 at GFZ Potsdam. Further information can be found here. The following acknowledgement shall be added to any new GRACE related publication (paper, poster etc. ): We would like to thank the German Space Operations Center (GSOC) of the German Aerospace Center (DLR) for providing continuously and nearly 100% of the raw telemetry data of the twin GRACE satellites. Since January 2011 GRACE ground segment operations are co-funded, besides significant GFZ and DLR R&D contributions, by ESA. Therefore, ESA is supporting the continuation of the measurements of mass redistribution in the Earth system. The newest Level-1B and Level-2 products are made available at approximately monthly intervals. Level-1B data refer to the collection of ranging, accelerometry, attitude and related ancillary data. All products have been created by the NASA/JPL element of the SDS. At present, data prior to Jan 1, 2005 are labeled Release-00, and all the data, thereafter, are labeled Release-01. Please see NOTE-1 below for special remarks on AOD1B products from June 2006 to Sep 2007. Please see NOTE-4 below for special remarks on Level-1 read software suite. RL-01 Series is now discontinued. See NOTE-2 about July 2007 field. All months from Aug '02 to present; except Sep '02, Dec '02, Jan & Jun '03, Jan '04 The RL-03 fields are not available past Jan 2007. See NOTE 1 about Jun '06 till Sep '07 fields. NOTE-1 (Feb 12, 2008): If you downloaded AOD1B RL04 products for the period June 23, 2006 until September 20, 2007 prior to November 30, 2007 please be sure to download these files again because the oceanic contributions to these products are wrong (by mistake twice reduction of atmospheric S2 tide from surface pressure data used to force the OMCT model). Please also see NOTE-3 below for impact on Level-2 GSM products. The correct AOD1B RL04 products for this range of dates have to have a product creation date later than November 2007 within the header information, e.g. NOTE-3 (Feb 29, 2008): The influence of the error in AOD1B product, described in NOTE-1, on the Level-2 gravity field products, though small, is not negligible. Therefore all GSM-products between June 2006 and September 2007 have been reprocessed with the correct AOD1B. Click Here for a summary of the principal changes in the Level-2 fields in this duration. - JPL: The new GSM and GAx product files will be made available after re-processing. Please review this page often, as it contains timely updates and information regarding the latest product releases. NOTE-4 (Apr 24, 2008): The GPS satellite PRN32 (SVN23) was set "healthy" as of Feb 26, 2008.Tracking of this satellite was therefore enabled on GRACE and the Level-1B data since Feb 26, 2008 contains GPS tracking data from PRN32. Consequently, the software to convert from GRACE GPS1x format to Rinex format has been updated to handle the presence of data from PRN32. Users should download and re-install the entire Level-1 Read software suite (RELEASE_2008-03-20) from the GRACE archives. This software is backwards compatible and can process all mission data. - Atmosphere & Ionosphere Products. Each product consists of one couple of files, the data file in a product specific format and the metadata file in the DIF format, which describes the content of the data file. The names of both files are identically except for the file name extension behind the last "." within the file name. Please refer also to the Online available documents concerning the GRACE Product release for further processing information. Detailed descriptions of the different product types are available in Product Description.